“Take the shortcut,” Tasha said. It sounded like a great idea at the time, since as typical teenagers, we were running late. But the shortcut wasn’t paved and my dad’s conversion van was no match for the mud. Perhaps we should’ve stuck to the long route (no pun intended). It took a knock on a stranger’s door, a diesel pickup truck, some hefty ropes, and wood under the tires to pull us out. So much for a shortcut, right?! Psst! Looking for the quiz? Scroll down! In business, whether we’re aiming for the fastest path, taking the long route, or something in between, we often find ourselves stuck. This can keep you from launching that course you’ve been dreaming of, prevent you from delivering content or hinder you from reaching your potential. Getting stuck, and especially staying stuck, can be detrimental to your growth if you don’t realize it’s happening or can’t figure out how to break free. Don’t give up on yourself just yet. If you can pinpoint where you’re getting stuck, then you can find a solution. Imagine that you’ve been wanting to launch a YouTube channel, but you keep putting it off. You need to determine what’s holding you back. Are you afraid of being on camera, don’t know what equipment you should buy, not sure what topics to talk about, can’t think of a cool name for your channel, or feel you just don’t have time to plan it all out? 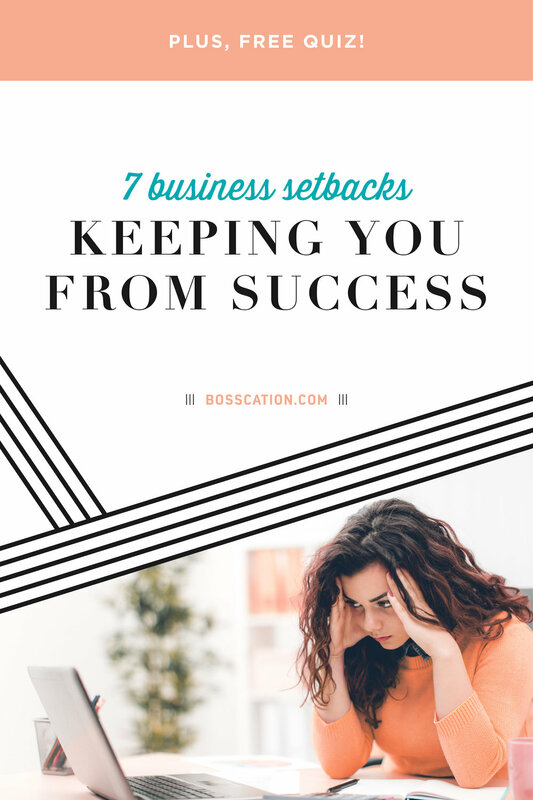 These setbacks sound more like excuses (#sorrynotsorry). Once you evaluate what’s hindering you — perhaps you’re not sure what topics to talk about — then ask yourself, “what are 10 ways I could overcome this?” For our YouTube example, you could ask your audience what they’re looking to learn, search for other YouTube channels that reach a similar market and get inspired by their topics, do a brain dump of everything you know about your field, etc. Usually this one comes down to a lack of prioritizing your time more than a lack of time in general. We all get 24-hours in a day… you need to use them wisely. Analysis paralysis and indecision have been some of my biggest hindrances. I tend to overthink and over evaluate every decision, often changing my mind every week. Being slow to make decisions, or lacking to make them at all, can keep you from moving forward at a good pace or at all. (And if you’re ever on Shark Tank, it can cost you a deal)! Ah, the good ole’ burden of being a perfectionist. You know that done is better than perfect, but you still can’t get yourself to put out anything slightly sub-par. Planning… tweaking… planning… tweaking… you’ll never finish if you don’t start taking action! I think this one is a compilation of the others. You spend all of your time planning, but then get stuck on a decision or don’t feel it’s perfect, so you do more planning. Rather than actually writing that blog post, creating that course, or recording that video, you feel you need to research your topic a little more. Just one more book… one more webinar… one more podcast, then you’ll feel knowledgeable enough to get started. You feel you aren’t smart enough, good enough, experienced enough to be doing what you’re doing, so you play it small and safe or never get started at all. Maybe in a few years, or after I’ve accomplished X, you say. Imposter syndrome can really keep you from reaching your potential and going for your dreams. If only money grew on trees, then we could hire an amazing team, attend every conference, and buy every time-saving software. Unfortunately, it doesn’t, and we’ve all got bills to pay. Like time, this one often comes down to prioritizing it wisely, not just finding more of it (though that definitely helps). When I worked in marketing at ION Television, our department joke was, “there’s always a solutION" — that phrase has stuck with me ever since. With that said, over the next few weeks, I’ll be sharing solutions for overcoming some of these setbacks.